Native Americanism, which, triumphed momentarily in the burning of St. Michael's and St. Augustine's, stripped of its pretenses, was simply a movement to put Catholics out of political life - out of public office, out of the polling place - in truth, to keep them as far as possible out of America. "America chiefly for the native-born," they might have claimed for their slogan, but a much truer one would have been, "America for Protestants only." The society died a miserable death in a few years, but the spirit has lived on, and has manifested itself in other nation-wide organizations from time to time, the latest being the K. K. K.'s of yesterday. This spirit had been active, of course, before the rise of the Nativists; it had, for example, permeated the Federal Party, dominated by the Tory element in the population. But with this difference that it was the ascendancy not of an amorphous Protestantism but of the particular brand of the Church of England that the Federalists sought. And it is interesting to note in this connection that when the Alien Acts passed in 1798 in the presidency of the Federalist, John Adams, the Irish Presbyterians objected strenuously. The Constitution had simply not worked the miracle of suddenly changing the hearts of the people. Bigotry had been bitter and widespread in the colonies before the War of Independence, and it continued bitter and widespread, though less demonstrative because of the friendship with France, after the birth of the Republic. Nor did the individual States immediately bring their constitutions into harmony with the provisions of the Federal document regarding religion. It was only in 1833 that the union of Church and State was dissolved in Massachusetts; and Catholics were disqualified from holding public office in New Jersey up until 1844, and in New Hampshire until 1877. The miracle is, indeed, when we reflect on the hatred for the Faith, the chronic, deep-seated hatred, when we recall the bodeful reaction of the people's representatives in the Second Continental Congress to the passing of the Quebec Act, that Article VI and the Amendment of 1791 should ever have been adopted. The natural explanation may be that it was a case of one sect's watching the other and determined at any cost that the other should never dominate. But we believe in the Providence of God, and nowhere else in American history do we see Its working so resplendent as in the adoption by the U. S. Congress of the provisions which are our guarantee of religious freedom and equality. Thus true Americanism was not abroad in the early days; it was a new thought however generated, a startling departure from the intolerance which had characterized most of the colonies; something to which the discrimination still practiced in the States was utterly alien, something which would extend its influence only slowly and which at the present time is still far from complete victory. Well, at any rate, in the later colonial days and in the Republic's infancy there was something of a feeling against the foreign population in general, a hatred for Catholics, and an intense hatred for foreign-born Catholics. Now in the eighteenth century there had been an enormous influx of colonists from Ireland, and in the first fifty years most of them had been Presbyterians. These were not looked upon with much kindness by the members of the Church of England, but the hostility between the sects diminished as their opposition to Catholic growth drew them together. For in the second half of the century the great Irish inpouring was becoming more and more Catholic in character. The Presbyterians, grown to a power everywhere, directed the bigotry, as might be expected of them, against the Irish Catholics. As the years of the nineteenth century went by and the Irish Catholic immigration increased, and Presbyterianism waxed stronger and its ranks came to be made up in great measure of the native-born, the intense hatred for foreign-born Catholics narrowed and mounted into a fierce fanaticism against the Irish who professed the Catholic Faith. So we come into the thirties of the last century (1830’s) and we find this hatred intensifying, rising to a climax. The Protestant churches resounded with fiery denunciations of the "abomination of Romanism." The Pope was depicted now as anti-Christ, now as the vilest and lewdest of men, now as a foreign potentate looking to the conquest of America through the insidious operations of his Irish subjects here. Pamphlets were circulated alleged to contain the revelations of ex-nuns and ex-monks. Secular newspapers throughout the country devoted themselves to the propaganda. One understands that violence could not be far off. The first outbreak of importance was the burning of the Convent of the Ursulines at Charlestown, Mass., in 1834, and the cruel treatment of the poor nuns and their pupils. Then the Native American Society was formed in New York in 1835, and quickly spread through New England. 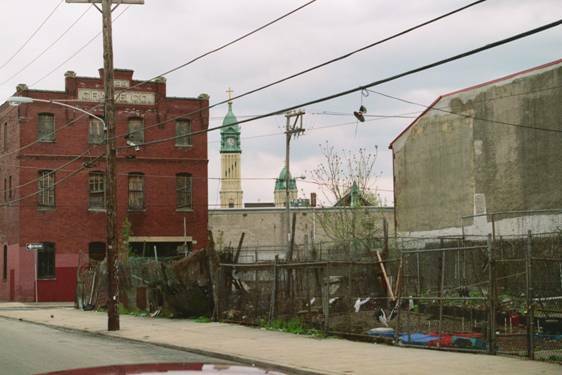 Its first meeting in Philadelphia was held at Germantown in 1837, from which issued this manifesto: "While at the same time we invite the stranger, worn down by oppression at home, to come and share with us the blessings of our native land, here find an asylum for his distress, and partake of the plenty a kind Providence has so bountifully given us, we deny his right (hereby meaning as foreigner any immigrant who may hereafter arrive in our country) to have a voice in our legislative hall, his eligibility to office under any circumstances, and we ask repeal of the naturalization law, which, it must be apparent to every reflecting mind, to every true son of America, has now become an evil." This was the thin camouflage in which Nativism wrapped itself while it moved to crush Catholicism. But everybody knew that its aim was against one class of foreigners, the Irish Catholics. And everybody knew when it had work of violence to do and sent out a call for volunteers, the foreign-born as well as the native-born were welcome to riot under its banners. But the society made little progress in Philadelphia until the beginning of 1844. It was certainly not that the bigotry here was of a mild form. Very likely it was because the need of the organization was not seen, its possibilities were not realized. "Resolved, that no children be required to attend or unite in the reading of the Bible in the Public Schools, whose parents are conscientiously opposed thereto." "Resolved, that those children whose parents conscientiously prefer and desire any particular version of the Bible, without note or comment, be furnished with the same." The latter resolution was framed and adopted with malice aforethought, for it was very well known that there was no Catholic version without note or comment." But the resolutions of the Board could be disregarded with impunity anyhow; Protestant teachers paid no attention to them. The wrongs were not righted, and Catholics, with no hope of obtaining justice, suffered on patiently through 1843. This phase of the situation seemed likely to amount to very little. But at the beginning of 1844 the arch-villain of the tragedy came on the scene. It was the Rev. Walter Colton, U. S. N., lately transferred to the Philadelphia Navy Yard (which was then, as you may know, at the foot of Prime and Wharton Streets). Now a Navy chaplain's job is pretty much what he wishes to make it. He can find so much to do endeavoring to better the morality as well as the morale of the men, as to have scarcely a moment to himself day or night. On the other hand, if he chooses, he can be a gentleman of leisure, and in all probability the skipper and executive officer will thank God that he is not getting in their way. Well, the Rev. Mr. Colton was of the gentleman-of-leisure type; but he was a gentleman of leisure who wished to advertise himself, not by hard work, never by that means, but by some easy coup; and one day looking through some Philadelphia newspapers he saw opportunity staring him in the face. "The Bible in the Public Schools from the first number of the Quarterly Review of the American Protestant Association. A reply to the allegations and complaints contained in the letter of Bishop Kenrick to the Board of Controllers of the Public Schools." It was malicious, slanderous print. It accused Bishop Kenrick of trying to tyrannize over non-Catholics because he called himself Bishop of Philadelphia. It twisted his objections into a demand for the removal of the Bible from the public schools and for the suppression of all religious exercises. It repeated all the stale lies against the Church that the reverend naval chaplain had been able to recall at the moment of writing. It was sent broadcast through the schools and it immediately caused a fever of excitement. All the rampant bigotry was now drawn and focused on this one point of the alleged desire and endeavor of the Catholics to take the Bible out of the schools, away from Protestant children. The fanatical elements seemed suddenly to realize that the Native American Society was an excellent organization in which to unite for the crushing of the minions of Rome; and in the course of the next month or two there was a branch of it in every ward and district of the City and County. What was required for membership was that one be a Protestant; it mattered not at all where one had been born. The branch in Kensington had an enormous membership immediately. Here excitement was at its highest pitch, for the Protestants had been for some time in a rage over the growth and progress of St. Michael's Parish. A meeting characterized by a fierce enthusiasm was held in Commissioner's Hall on March 4, 1844. "The words 'without note or comment' introduced into the latter Resolution effectually nullified the concession which it seemed to make, since Catholics have no vernacular version unaccompanied with notes. It was, besides, a virtual adoption of the Protestant principle that the Bible without note or comment is the rule of faith, and it was consequently the assumption of a sectarian basis for public education. Of this, however, we would have offered no complaint, as long as Catholic children were not compelled to read the Protestant version, since the result in this regard would have been merely to deprive them of reading the Bible in school-hours; a result not at all to be deprecated, since the reverence for its contents is seldom increased by its perusal as one of their daily tasks. "A great grievance was left without a remedy. Catholic teachers felt conscientious scruples to read the Protestant version, and a respectable lady has been dismissed for refusing to read it, and another was denied promotion on that sole ground, and other teachers had been tampered with, and induced under fear of dismissal to betray their conscience. The Controllers dissembled this injustice, and the same system continued to be pursued so that this regulation was an effectual bar to conscientious Catholics becoming principal teachers in the Public Schools. The injustice still continues. How can it be persevered in whilst the rights of conscience are declared inviolable by the Constitution, it is difficult to conceive. The directors or controllers can have no right to require any act against conscience. It may be fairly doubted whether they can at all require the reading of the Bible. They cannot require it as a religious exercise. They cannot determine for the community at large which is the Bible - whether it contains thirty-nine books of the Old Testament or forty-six - they cannot decide which is the correct version of the Bible - and they cannot prejudice the determination of either question by adopting for the use of the Public Schools - to which all citizens have equal right of access - one version, to the exclusion of another. All their power is derived from the school laws, and these are generally based on the Constitution, which recognizes no religious distinctions, but gives equal rights to all. It would be a strange thing for the Legislature itself to undertake to choose for the citizens a Bible, or to choose it for the children who frequent the schools, so as to create in their minds impressions inconsistent with the religious predilections of their parents. We have no hesitation in saying that the Legislature has no such power. All public bodies and public officers acting in virtue of the Constitution or laws are supposed to regard the differences of religion with indifference and impartiality; and the preference of a sectarian version is consequently a violation of that constitutional justice due to all. "Do Catholics wish to obtrude their version on the Public Schools? Certainly not. We only ask not to be forced to use any but our own. We ask this for the teachers as well as for the children; for if these are protected by the law which guarantees their religious predilections, those stand on the high constitutional ground, that the rights of conscience cannot be infringed. "We are unacquainted with the facts which have given occasion to a meeting of Bible zealots in Kensington, who have resolved to move Heaven and earth to maintain the Protestant version in the schools. We surely do not ask for its exclusion. We ask that the reading of it may not be forced on us. If the Controllers or Directors wish the Bible to be read, let it be optional with the teacher or child to use either version. Let it be forbidden to read comments or notes in school, or to give comments; but let not our version be excluded, by requiring that there be no note or comment to the book itself. The cry that we want to exclude the Bible altogether from the schools is entirely groundless. Certainly we should not choose it as a schoolbook. It is at the holy altar with reverential awe that we would recite the divine oracles, and we would unfold them from the chair of truth, and meditate on them in private on bended knees, and not put them in the hands of children to be torn or disfigured as schoolbooks. But we are far from prescribing rules to our fellow-citizens at large. If they wish that each teacher and each pupil read the Bible in the schools, we have no disposition to interfere, provided our consciences are left free, and the rule be not used as a trap to ensnare us, or a bar to impede enjoyment of the advantages of the public institutions. The spirit of those who oppose us may be known from Mr. Colton's pamphlet, wherein sectarian ascendancy is openly aimed at. (Editorial continuing:) "We have not so understood the Constitution, or the legislation, or the history of the country. We deny that the land is Protestant. Maryland, a Catholic colony, at once refutes the assertion. The spirit of Protestantism is not that of our institutions. They are based on the enlarged views of universal benevolence, not narrowed by the negative, prescriptive character of sects. The rights and privileges of the country have been steeped in Catholic blood, commingled with the blood of Protestants. The sons of Maryland bore their part in the struggle. France gave its assistance; and the Declaration of Independence bears on it a Catholic name - one who periled a princely fortune and life in the cause of independence and left an unsullied reputation. "We would respectfully implore the friends of public education to put to rest this question, which the impudence of the Naval Chaplain has called up; and we fearlessly tell them that there is no way of doing it but by the strictest neutrality and justice. Let the Controllers and Directors put an end to this tampering with conscience; let teachers and children be left untrammeled in a point so delicate; and let all sectarian maneuvering be rigorously excluded from the schools, that all citizens may know that their children may frequent them without prejudice to their religious predilections. Justice, Freedom of Conscience, Equal Rights are what we ask." However it was useless to expostulate with these fanatics. The ingenious Colton had supplied them with what they wanted, a good pretext; had transformed the perfectly fair and just attitude of the bishop and his people into an insult and a menace to the Protestant population. If God Himself had spoken from heaven and told them that the Catholics never had the slightest intention of doing them an injury, it would not have made any difference. They were determined to believe this thing and they were going to vent their wrath. On Monday, March 11, a great mass-meeting was held in Independence Square. About six thousand persons were present - in which number, it must be said, were included many Catholics who had attended to see what evil design was afoot. There was no violence. A resolution was offered and adopted "to resist the attempt to banish the Bible from our public institutions." The Church was denounced in no uncertain terms by excited orators, particularly a Rev. Mr. Berg, for the very things of which the Nativists were themselves guilty - opposing civil and religious liberty and seeking to effect a union of Church and State. "I, the undersigned, finding that false impressions prevail with regard to the views and wishes of the Catholic body, with whose spiritual care he is charged, on the subject of the Public Schools, beg to state them in a few words to remove misconceptions. "Catholics have not asked that the Bible be excluded from the Public Schools. They have merely desired for their children: the liberty of using the Catholic version, in case the reading of the Bible be prescribed by the Controllers or Directors of the Schools. They only desire to enjoy the benefit of the Constitution of the State of Pennsylvania, which guarantees the rights of conscience, and precludes any preference of sectarian modes of worship. They ask that the school laws be faithfully executed, and that 'the religious predilections of parents be respected.' They ask that the regulations of: the Controllers of the Public Schools, adopted in December, 1834, be followed up, and that the resolutions of the same body, adopted in January, 1843, be adhered to. They desire that the Public Schools be preserved from all sectarian influence and that education be conducted in a way that may enable citizens equally to share in its benefits, without violence being offered to their religious convictions. While seeking to placate the Bible zealots, he was nevertheless determined that Catholic children should not be proselyted in the public institutions, and on the same date, March 12, he again sent a complaint to the School Board that its regulations were not being observed, and reminded them that he was not trying to have the Bible excluded from the schools. A committee of Catholic laymen also memorialized the board, stating that the resolutions passed December 9, 1834, were being "notoriously disregarded in several of the Public Schools of the City and County," charging that those adopted January 9, 1843, had no effect because "never officially communicated," demanding that the words "without note or comment" be stricken from the latter, and asking that the resolutions of '34 with the amended resolutions of '43 be enforced, and that the reading of either version of the Bible be left to the consciences of teachers and pupils respectively. This was signed by forty-nine prominent Catholics of the City and County, among them Michael Keenan Michael McGill, Bernard Maguire, John Eicock, and Henry Crilly, all of St. Michael's. The Board with these communications before it as well as the resolutions adopted at the meetings of the Nativists, at first voted ten to nine to postpone the consideration of the matter indefinitely. Then they resolved unanimously to furnish directors and teachers with copies of the resolutions of '34 and '43; and finally voted eleven to eight for a measure to disqualify teachers who violated regulations from receiving pay. There were three Catholics on the Board. One of them, Mr. Hugh Clark, was an alderman in the Kensington District, a parishioner of St. Michael's and one of its first trustees. He and his two coreligionists, Lyons and O'Donnell, a small minority, were placed in a very difficult position, but with prudence and courage did everything possible to secure the rights of Catholic children. It must be kept in mind that all the while in City and County there was a great, silent mass of citizens who were not in sympathy with the Bible zealots. Here and there one would wax indignant at the injustice of the attacks and voice a protest. William H. Furness, for example, in an address delivered March 17, in the First Congregational Unitarian Church, defended the Catholic attitude admirably. But the bigots were unrestrained; everywhere they were loud and active; Kensington in particular was seething with their agitation. At any moment some slight incident might bring the fanaticism to a head, might turn the hatred to a madness which would express itself in physical violence. The astonishing thing is, when we think of how the Catholics were baited and persecuted and slandered, that the hot blood of some of the Irish Catholic youths had not already impelled them to violent demonstrations. Human nature so goaded could not bear such wrongs with the patience exhibited by the Catholics of Philadelphia in those days unless strengthened by the grace of God. Well, the slight incident came at the beginning of May. Hugh Clark, as an alderman and member of the School Board, went into the public school at the southwest corner of Second and Master Streets, and informed one of the teachers, whose disregard of the regulations was contemptuous and especially offensive, that her pay would be withheld unless the conduct of her classes conformed to the resolutions passed by the Board. Mr. Clark was a man of irreproachable character, much admired even by many of the Protestants in the district, and one who in the discharge of his duties as a magistrate had been noted for his prudence and kindliness. There is no reason to think that on this occasion he acted otherwise than in his usual quiet, dignified manner. So on Friday afternoon. May 3, a meeting of the furious Nativists of the immediate neighborhood was held on the open lot adjoining the school - about three hundred were present. Orators set about to inflame them further with lying accounts of "this outrage." In the middle of an impassioned speech some Irish lads armed with clubs appeared on the scene and attacked the meeting with such vigor that the Nativists dispersed. And now the dreadful fate was upon the priests and people of St. Michael's. Another meeting of the Native American Association was called for Monday afternoon at the same place, and with this would begin the bloody riots of '44, the mere account of which is appalling. If no further explanation were given we should wonder in reading that account, notwithstanding what we know of the bigotry, how such atrocities could go unchecked, we should ask where was the strong arm of the Law, we should be amazed to see the Sheriff of the County so pathetically unable, or so basely unwilling, to cope with the situation, we should say that Philadelphia County had become a great madhouse overnight. The truth is that these riots were the horrible climax of a lawlessness which had been growing steadily for years. There had been the Weavers' Riots in Kensington and the Northern Liberties in 1828; the Orange Riots in the City in '35; the anti-Abolitionist Riots, during which the new home of the Abolitionists, Pennsylvania Hall, on Sixth Street below Race, was destroyed and an attack was made on The Shelter for Colored Orphans on 13th Street above Callowhill; the recent Weavers' Riots in Kensington of '43. There had been so many outbreaks against the Negroes since 1829 that one might almost say the rioting against them had been continuous. Rival hose companies would engage, sometimes in pitched battles, sometimes in rather unexpected clashes in responding to an alarm - and usually in this case the burning building, if there was such, would go on burning merrily while they tried to wreck each other's apparatus and do bodily injury. Crime of every description had been on the increase. The fact is that a great number of the population had lost all respect for, and all fear of, the Law. For one thing, it was easy to escape arrest after a violation; it was usually merely a matter of going a little distance, sometimes of just crossing to .the other side of a street, for each district had its separate government. And even if a violator were apprehended, with a crafty lawyer he would as likely as not get off scot-free, no matter what the evidence were against him. A striking instance of this laxity of the courts is the case of James Wood. He kept (in the late thirties) a fashionable confectionery store on Chestnut Street between Fifth and Sixth. However his disposition was not so sweet, and when he discovered that his attractive daughter, who had been cashier in his establishment, had married a certain bootmaker clandestinely, he murdered her brutally. There was no doubt whatever that he had committed the crime. But his counsel pleaded "the French doctrine, that a desire to commit murder is moral insanity," and Mr. Wood was acquitted. "The fact is established that the moment the difficulties began, Sheriff McMichael called upon General Cadwallader and solicited him to call out his brigade, as he (the sheriff) had no force to oppose such an infuriated and numerous mob. This the General declined. Subsequently, however, and at the sheriff's repeated solicitation, General Cadwallader called out his brigade, but then the riot had already done great harm. No man will question General Cadwallader's bravery, but we are assured that one great reason for his hesitation was the doubt in his mind about the power of the sheriff to command him to fire upon the crowd, and the propriety, if he had, of so doing. There were other reasons; among them the fact that no remuneration for the services of the soldiery heretofore called out in case of public disturbances had ever been extended. Was Sheriff McMichael to blame for this delay? Such was the foresight of this gentleman, that knowing how unprepared he was in case of any great public outbreak, he spent a whole week last winter at Harrisburg trying to get a law passed giving him the power to raise an armed force of sufficient numbers to put down any such tumult. This the Legislature refused, and as he predicted to us on his return from Harrisburg, with the worst results. It is true the Governor has taken the responsibility on himself, backed by the opinion of the Attorney-General, to order the troops to fire, but we consider that the sheriff of a county like Philadelphia should be clothed by the next Legislature with ample power to act in any future emergency." Alexander's Express Messenger stated that "the law saddles the sheriff with responsibilities without investing him with the means of discharging them." This Morton McMichael was to be Mayor of the City of Philadelphia from 1866 to 1869. There is a statue in bronze of him in East Fairmount Park, for he became President of the Park Commission in 1867.